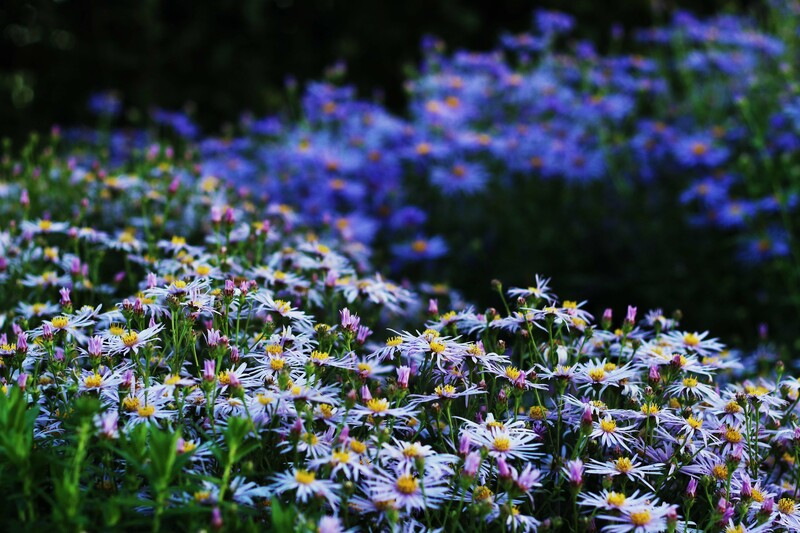 Asters have a perpetual habit in late summer, much like the ever popular snowdrop in winter. They are the plant on every gardener’s lips and are the topic for most horticultural magazines and newspaper articles. What amazes me most about them is their sudden appearance. You won’t hear a mention of the “A” word throughout most of the year. If it happens to slip out it can cause a slight shudder amongst gardeners with a reminder that Autumn is coming and the season is drawing to a close. Low and behold, although expected, their sudden arrival is always a surprise. Asters are famously late summer flowers, leading the garden with a “once more unto the breach” assault on Winter before she fully takes hold. Even on this wet and gloomy day, as I hunt out Asters to share with you I notice a resurgence of colour in the Rose Garden brought about by these plants; a second life. The Rose Garden has become a ‘phoenix’ rising from the ashes. In fact, there’s a great poem linked to Asters and the name of Michaelmas daisy. Derived from the Archangel St Michael who was chief of the archangels. I think this sums up their late seasonality perfectly. However, you can have Asters from late spring and early summer with species like Aster alpinus and the frikartii hybrids. 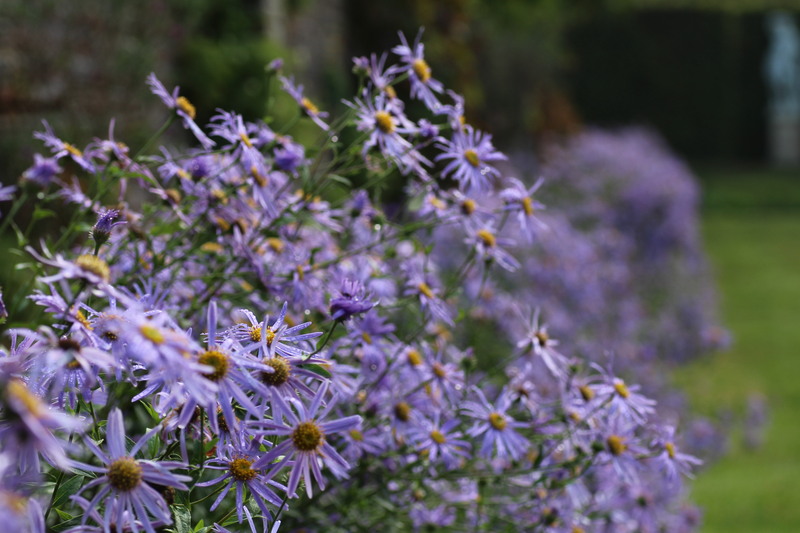 Within Sissinghurst our Asters can be found predominantly in the Rose Garden and Top Courtyard. 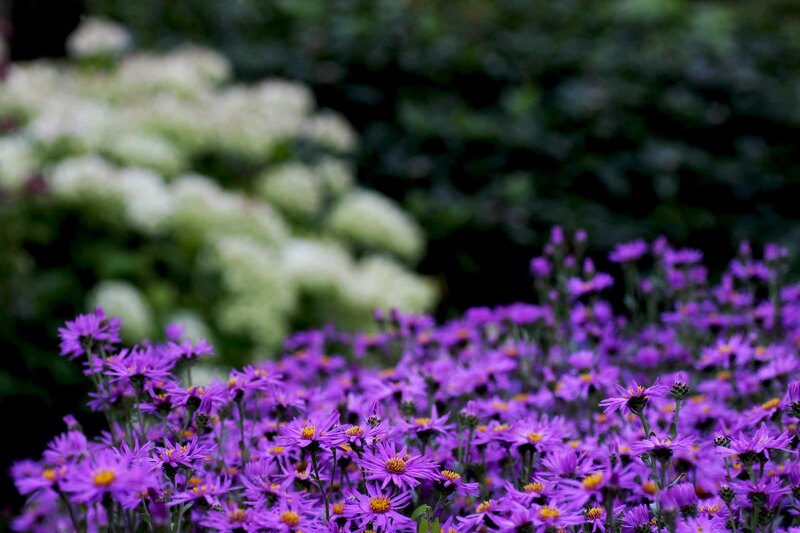 We have varieties from the European and Asiatic group which are now known as ‘Asters’. These are a great formal group resistant to the dreaded powdery mildew and requiring full sun to partial shade with an alkaline soil. We have Aster amellus ‘Violet Queen’ adding a purple glow beneath the hanging shadow of Hibisicus ‘Ardens’ and Aster x frikartii ‘Wunder von stafa’ which was one of a few successful hybridisations between A. amellus and A. thomsonii. I saw a fantastic Aster called ‘King George’ when I worked at Waterperry Garden the other week, growing next to Rudbekia fulgida var deamii, making an amazing combination. Interestingly, ‘King George’ had its named changed just before World War 1 from ‘Kasier Wilhelm’ to its current name for obvious reasons. The New York Aster, now known as ‘Symphyotrichum novi-belgii’ has always been the popular choice for breeders and gardeners. 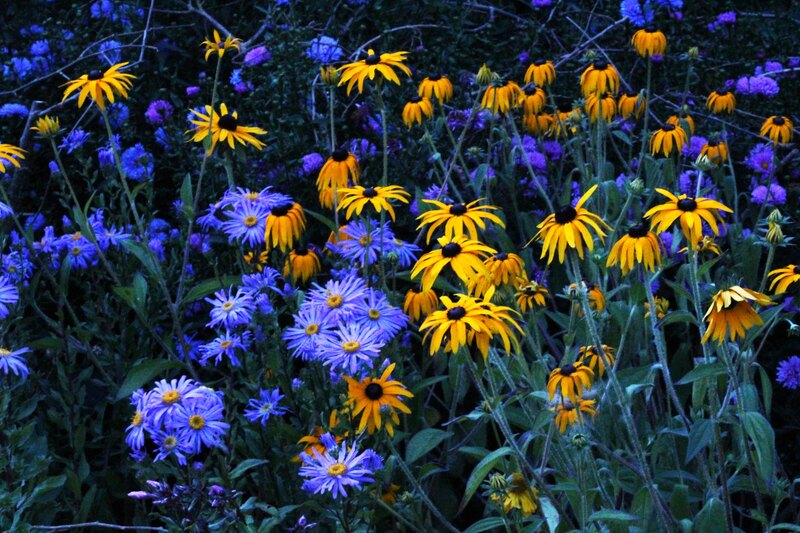 They can have stunning single or double flowers complemented by midnight dark stems. They do, however, succumb to the crippling disease (Aquilegia growers cover your ears) of powdery mildew, so moisture retention and air flow are key, which is especially hard for us to achieve when trying to mimic Vita’s planting style. The majority of the Novi-Belgii are found in the purple boarder as they extend its season. We have ‘Cliff Lewis’ which is a tall variety, with deep purple flowers and which sits at the front of the border and requires strong staking. Next to him sits ‘Carnival’, a very striking double pink variety causing me to pray to St Michael to invoke the wrath of mildew as to remove it. Other North American Asters are the New England Asters or Symphyotrichum novae-angliae which can be found in the Rose Garden. Not as elegant as Novi-Belgii in growth, they have a more naturalistic feel. This species is also pretty resistant to mildew and rust, making a great naturalistic perennial plant, able to jam in amongst other perennials. We grow Symphyotrichum novae-angliae ‘Andenken an Alma Potschke’, bred in Poland by Potschke in 1969. This plant is stiff and upright and requires no staking and produces a mass of cerise pink flowers, a great plant to catch the eye. Just up the brick path grows ‘Andeken’s’ older and taller sister ‘Lucida’. ‘Lucida’ produces purple-red sprays and stands very tall requiring us to stake strongly. Her sheer size and mass can fix a corner and anchor it perfectly. This is how she grows in the Rose Garden, masking plants so that people have a surprise when passing around her. As gardeners we are incredibly lucky having over 300 varieties to indulge ourselves with. I would recommend visiting the gardens of Waterperry and Picton and maybe buy an Aster and celebrate Michalemas day on the 29th. To have a species that can play equal roles in formal and informal planting is truly fantastic. In fact I have a Doellingeria umbellatuis screaming to be placed next to my Eupatorium – whoops! Meant Eurotichum – will these name changes ever end?